Lovely 15 lb fruits are hubbard-shaped and a brilliant red-orange in color. This variety was first documented back to 1831 by Fearing Burr, the author of Field & Garden Vegetables of America. This variety was first mentioned being grown by Mr. J.M. Ives of Salem, MA. Mr. Ives had received seeds from a friend in Northampton, MA, who had obtained his seeds from a friend in Buffalo, NY. This variety came to be grown in the Buffalo area after a tribe of Native Americans traveled through the area and distributed seed. 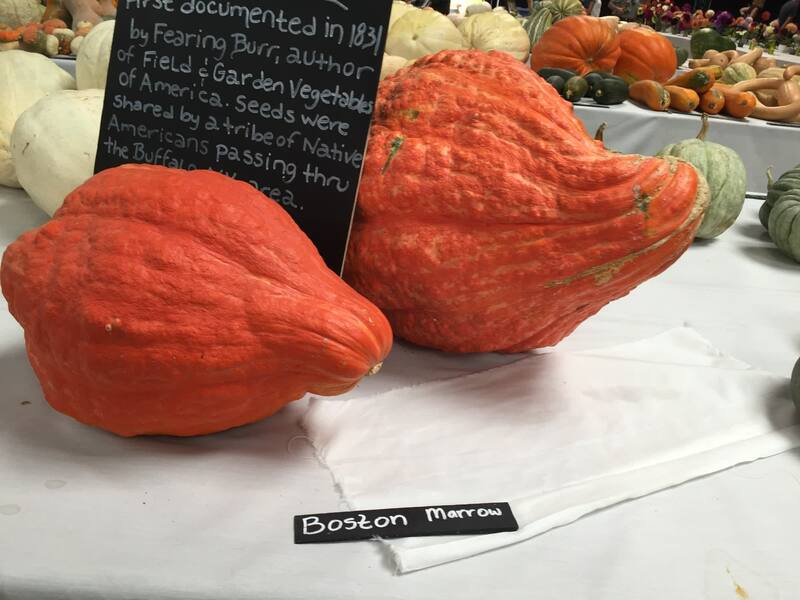 From this historic introduction, Boston Marrow soon became one of the most important commercial squashes for 150 years. As the 21st century approached, nearly every seed company had dropped this unique treasure. In 1881 D.M. Ferry�s catalog said, �Very dry, fine-grained, and for sweetness and excellence, unsurpassed; a very popular variety in the Boston market�. Montana, USA: Native American Heirloom grown by the Seneca Indians in the Buffalo NY area. MANY uses for this squash. Each vine seems to set two large fruits ranging from 15-40 lbs. As well as many small fruits that are meant to be picked as summer squash, as well as many blossom for fried flowers. So once you see the big ones set and growing (about 5-10 lbs), harvest new squash at tips for summer squash right up to frost. Otherwise they do just shrivel up and fall off. 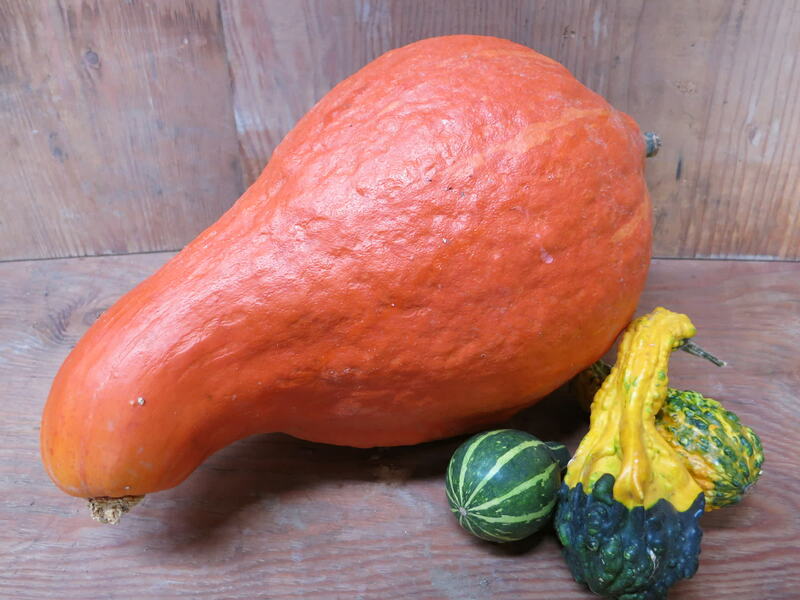 A unique variety in that it has multi uses as a winter squash , summer eating and flowers. This squash also sends out new roots at the vine nodes to gather water and food for the huge fruits. Hungary: Planted in mid May. Had 2 plants and got just 2 squash, but they were huge. Fine texture. Will grow again. Texas, USA: The downsides to this squash are its large real estate requirements and its low productivity. For the same space, you can grow much more productive squash. Washington: I had 4 squashes from my one plant. One of them was over 40 pounds and won best in show in the squash division of our County Fair. The other three were at least 10 pounds each. and yet...and yet...sad to say, I won't grow it again because despite its great taste it's too hard for a retired couple to deal with squashes this size in the kitchen.